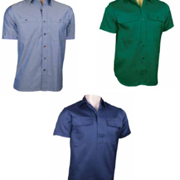 Promote your business by have this timeless Corporate Apparel - Chambray Shirts embroidered with your business name or logo. Timeless in design it features matching blue stitching; turtle-shell buttons, button down collars, two chest pockets,one with pen slot; which is twin stitched. Both long and short sleeves are available.